Once your Refreshing Mountain retreat wraps up, you might be bit concerned that your team, family or other group members lose sight of the lessons learned during this valuable experience. Though most retreat participants emerge with newfound knowledge, wisdom and possibly even a different outlook, some will inevitably lose sight of the retreat’s lessons as time progresses. Be proactive by following the advice set forth below and you will rest easy knowing your retreat efforts were not in vain. Some of those who coordinated their retreat attempt to reinforce the experience’s lessons and memories by directly reaching out to participants in the days, weeks and months that follow. Though this is somewhat effective, it won’t ingrain those lessons and memories in the minds of the participants. Examples of such conventional outreach methods include follow-up phone calls, e-mail outreaches, text messages and letters sent via snail mail. 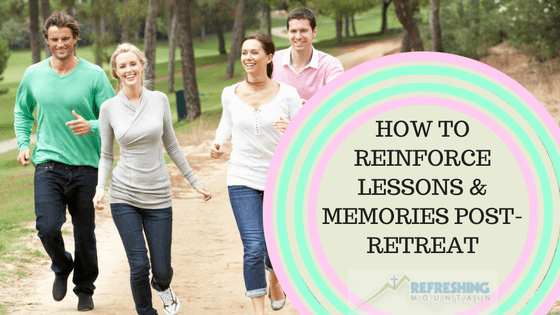 Let’s take a look at some better ways to reinforce the most important lessons, experiences and memories of your retreat. One of the best ways to spur retreat participants to review their experience is to hold a survey. Use the survey as an opportunity to stimulate the minds of retreat participants. They’ll look at your survey questions and jog their memories regarding what happened during the retreat, the “moral of the story”, what they came away with and why it was such an important event. Be sure to ask thought-provoking questions that force participants to ponder the details of their retreat in-depth. Leave ample blank space for retreat-goers to write out detailed responses to your questions. Dangle the prospect of prizes for the retreat’s most enthusiastic participants before heading out to your next retreat. This way, participants will be more inclined to give their all, truly engage in the retreat’s activities and depart with meaningful lessons. If your retreat has already occurred, do not hesitate to pass out such prizes. Giving someone a memento for participating in the retreat will reinforce the lessons learned and inspire him to share his experiences with others. Prepare some materials featuring the retreat’s lessons, the retreat’s slogan or the name of your retreat destination. Pass them out after the retreat is over and the participants will have something that reminds them of this valuable experience. Each time they see the retreat-themed item they will think of the event’s experiences, the lessons they learned and this memorable time shared with others. Invite each retreat participant to a group discussion in the days following the event’s culmination. If you suspect that few retreat participants will show up, dangle some positive reinforcement in the form of giveaways, food, drink etc. Let each participant discuss what he gained from the retreat experience. Listening to others state what they took away from this special time with friends, family, co-workers or others will inspire participants to think back to just how valuable this shared experience was from their own perspective. Take some pictures at each of your retreats so you can use them on an ensuing image board. If you did not take any pictures of the experience, create an image board with pictures that reflect the retreat’s happenings and lessons. Ideally, the retreat participants will do more than merely observe this board. Encourage them to pick out their own images, possibly even allowing them to use images found on the web to create an image board that accurately depicts the memories and themes of the retreat.